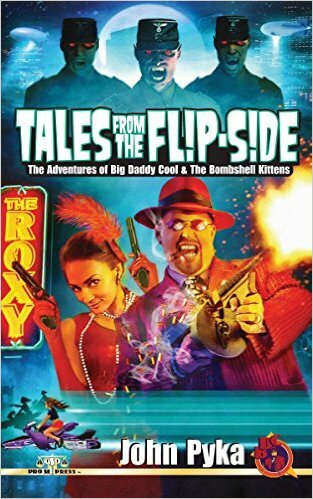 Tales from the Flipside: The Adventures of Big Daddy Cool and the Bombshell Kittens. Tales from the Flipside is a fast-paced, over-the-top adventure that doesn’t know when to stop. Johnny Dellarocca aka Big Daddy Cool and his Bombshell Kittens are determined to protect the universe and his Chicago-based club, The Roxy, from the sinister forces hell-bent on conquest. With the help of masked vigilantes and other heroes of the day, Dellarocca and his Kittens face off against enemies like Adolph Hitler and his army of vampires, Dracula, and the great monster, Cthulhu. For a debut novel, John Pyka knocks this adventure out of the park. With so much action going on, he manages to tell the tales without losing or confusing the reader. The world he creates is rich with possibilities, many of which are explored, but plenty of room is left for further adventures. The only complaint I have is the number of characters thrown at the reader. With so much going on and so many folks involved, there is little in the way of character exploration. I’d love to have gotten to know more about Big Daddy Cool and the Kittens. Perhaps in the next volume.